HERE IT IS! Gymboree FLASH Coupon Information! 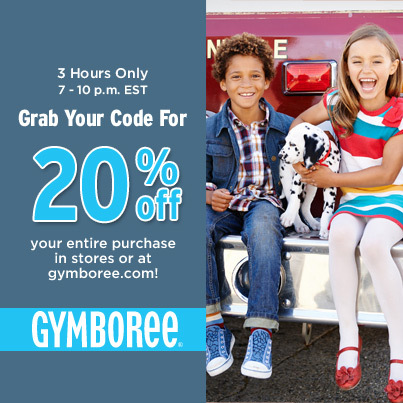 Disclosure: Thanks to Gymboree for supplying this coupon information to bloggers! No compensation or product was received. Visit the following link RIGHT NOW until 10pm EST to get your special 20% off coupon! You have until Thursday August 8th, 2013 to use it! They have an amazing sale right now to you can really save! 30% off regular priced styles and 20% sale merchandise. Plus you can earn Gymbucks AND use your 20% off coupon on top of that!